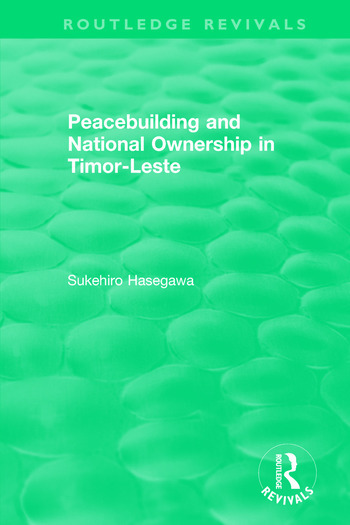 Originally published in 2013, Peacebuilding and National Ownership in Timor-Leste is an insightful, analytical presentation of developments that took place in Timor-Leste from July 2002 to September 2006. It reflects an intimate knowledge of events during this period and provides a detailed focus on the Timorese people and their leaders who struggled to lay a foundation for a free, peaceful and democratic nation. The book’s central theme is that of the commitment of national leaders to national interest, rather than the establishment of perfect institutional mechanisms that determines the success of a post-conflict country in achieving its stability. Sukehiro Hasegawa is former special representative of the UN Secretary-General for Timor-Leste (2004–2006) and professor of global politics in the faculty of law, Hosei University (2007–2013). He is currently President of the Global Peacebuilding Association of Japan.